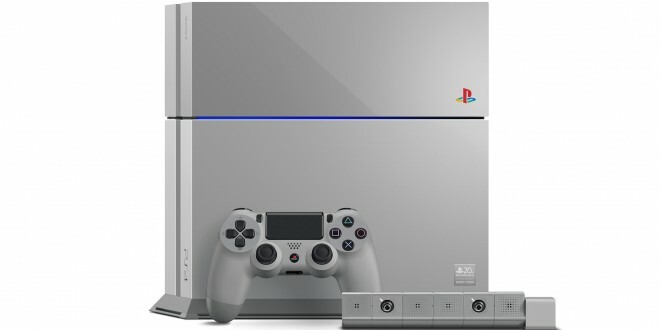 The 20th Anniversary Edition PlayStation 4 in "original grey"
Sony unveiled the sleek “original grey” PlayStation 4 20th Anniversary Edition today in honor of PlayStation’s 20th birthday. PlayStation fans beware, if you’d like to get your hands on one of these 20th Anniversary Edition PlayStation 4s, keep in mind that there will only be 12,300 available worldwide. Feeling like Fry from Futurama and are saying “shut up and take my money!” after watching that unboxing video? The 20th Anniversary Edition PlayStation 4 consoles are being sold for $499. Sony also gave fair warning to PlayStation fans in North America by stating that the 20th Anniversary Edition PS4 will be available in extremely limited quantities in the United States and Canada. Canadian and American residents that would like to pre-order the 20th Anniversary Edition PlayStation 4 should check out the PlayStation Experience keynote on Saturday, December 6th at 10:00 am Pacific (or 1 pm Eastern) for more details on how they can nab the “original grey” PlayStation 4. For those of us that will not be lucky enough to get our hands on the PlayStation 4 20th Anniversary Edition, Sony has made sure that we would not be left out of the 20th birthday celebrations. Sony has rolled out free 20th Anniversary themes for the PlayStation 3, PlayStation 4, and Vita that are now available on the PS Store. And for those wondering, you can breathe easy. The free 20th Anniversary themes will in fact include the iconic PS One start up sound. How’s that for a 20th birthday celebration?